My name is Jen McKay. I graduated from Kansas State University with a Bachelor’s Degree in Elementary Education in 2005. I am married and have 2 kids. I have taught 1st and 4th grade. I am currently teaching 4th grade at Village Elementary here in Emporia, KS. This is my fourth summer to work at Camp Alexander, and I have loved every minute of it. I was a counselor the first year and have been the director ever since. It is rewarding to see children learning, having fun, making new friends, as well as amazing memories in this amazing outdoor environment. My name is Juan Ramirez and I am a teacher at Village Elementary in Emporia, Kansas. I graduated from Fort Hays State University with a degree in elementary education. I also have an endorsement in Spanish and an ESL endorsement from Newman University. I started my teaching career back in 2000 and have been teaching since. My teaching career started in Dodge City, Kansas but I have been teaching in Emporia since 2005. During my free time, I enjoy playing sports and spending time outdoors. My favorite sports are soccer, basketball, and football. I also enjoy coaching my son’s soccer and basketball teams. As an educator, I enjoy working and teaching young students. I believe successful students stay active and continue to learn throughout the year. I think Camp Alexander provides great opportunities for students to continue developing skills throughout the summer that will help them be successful in the classroom at the beginning of the new school year. 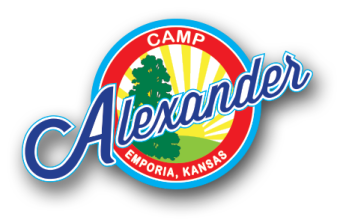 I look forward to the opportunity to work with past, present, and future students through Camp Alexander. My name is Carla Fessler and I am the Off-season Camp Coordinator. I keep busy assisting the Board of Directors with fundraising, grant writing and day to day operations at camp. I am the main contact person from September to May, and I am always happy to assist you with any questions you may have about camp. I served as the Camp Director from 2013-2016. I graduated from ESU with a degree in Elementary Education with a minor in ESL, an MS in Curriculum and Instruction, and an MS in School Counseling. I am currently a counselor at Riverside elementary. My husband Wayne and I feel very passionate about Camp Alexander and hope that each summer more children from our community get to experience what the outdoors and Camp Alexander have to offer. My husband and I are lifelong residents of Emporia. My name is Walker. I graduated from Emporia State University with a bachelor’s degree in Sociology. I have a bachelor’s degree in elementary education from ESU. I stay active playing basketball and working on vehicles. I love being outdoors and look forward to a fun filled summer. My name is Marcus Cornelius and I have taught fourth and fifth grade at Village Elementary School. I am currently a math teacher at Emporia Middle School. I grew up in Alaska and joined the Army in 2000 for 5 years serving at Fort Benning, Fort Gordon, Fort Stewart all in Georgia and Camp Stanley in Uijeongbu, South Korea. After the Army I found my way to Pittsburg, KS where I graduated in 2011 with my Bachelor of Science in Elementary Education with a minor in English for Speakers of Other Languages. I have a Master’s Degree in Educational Administration from Emporia State University. Even though I have a degree from ESU… I will always love Pitt State! Go Gorillas! In my free time I love to travel, camp, read, and run, mixed with a good amount of couch time as well. I have visited 99 National Parks and Monuments in my travels and I will hit 100 this summer! I love watching the Kansas City Royals and Duke Basketball! I know that is not the most popular around here but… go Duke! The counselors that work here are a great group of people and educators that care a lot about our community and the students here. Thank you for giving me the chance to work with your children in the summers! My name is Sarah Hill. I graduated from Wichita State University with a bachelor’s in elementary education. I have taught 4th and 5th grade for 12 years. I am currently teaching 5th grade at Village Elementary. I am looking forward to the sunshine and the great outdoors! My name is Shelby Pedersen, and I am a recent graduate of Emporia State University. I graduated with my Bachelor’s Degree in Elementary Education and I am currently working on my masters in Early Childhood and Early Childhood Special Education. Next August I will begin my first year of teaching at Maynard Early Childhood Center in Emporia, KS. This will be my 3rd summer working as a counselor at Camp Alexander, and I am just as excited as I was the first year. The staff are incredible to work with, and I love getting to know the new kids each year, and seeing the familiar faces. The best part of camp is spending time outdoors helping kids stay active during the summer! My name is Israel Alvarez. I have lived in Emporia for over 15 years. I’m an Emporia High and Emporia State graduate, and I spent 8 years in, both the Army and the Navy. I also work for the Emporia School district as a substitute teacher and I have volunteered for the Emporia Rec Center as a softball coach in the summers. I’m currently pursuing my Masters degree in Elementary Education at Emporia State and hope to start my career as an educator as soon as I graduate. Being a substitute teacher pushed me to pursue my masters degree and it has given me the opportunity to work with a wide range of kids, from kindergarten all the way up to high school, it also made me realize where my passion is at, teaching. My name is Jennifer Whaley. I am currently a teacher in the Emporia School District. Growing up, I babysat family friends every chance that I could. In high school I worked at an in-home daycare for a year before I left for college. During my college experience, I worked at Emporia Child Care with kiddos ranging from newborn to 2 year olds. I loved my time there and I miss those angels. My husband and I reside in Emporia and we love to play disc golf in our free time! I am so excited to begin work at Camp Alexander and I look forward to creating new memories with the kiddos! My name is Mike Atchison. I received my undergraduate degree in elementary education with an emphasis in special education from Washburn University. I also have a degree in secondary special education from Emporia State. I am currently a sixth grade English language arts co-teacher and resource teacher at Emporia Middle School. I am also an assistant football and basketball coach. In my free time, I love traveling the world and spend time outdoors. I enjoy reading, playing the guitar, and continuing to learn German. I also enjoy spending time with my wife, whom is from Germany. My name is Kathryn Whitcomb. I attended Emporia State University and majored in elementary education. Currently, I am teaching 7th grade science at the Middle School. I am also the head volleyball coach. In my free time, I enjoy spending time outdoors. I enjoy biking the Flint Hills and spending time on the ranch with my husband.